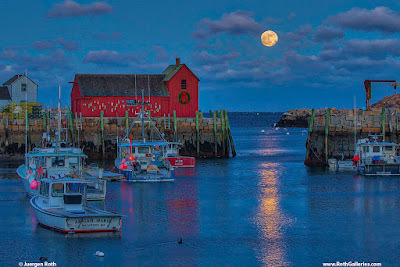 Great night out photographing the Wolf moon rising across this iconic New England landmark in Rockport, MA on Cape Ann. It is always very special to experience a full moon rise and this night was no difference. I am glad I stayed out during to capture the supermoon break through the clouds. Being able to incorporate the moon reflection into the composition was the icing and so worth the wait and bracing the frigid temps.